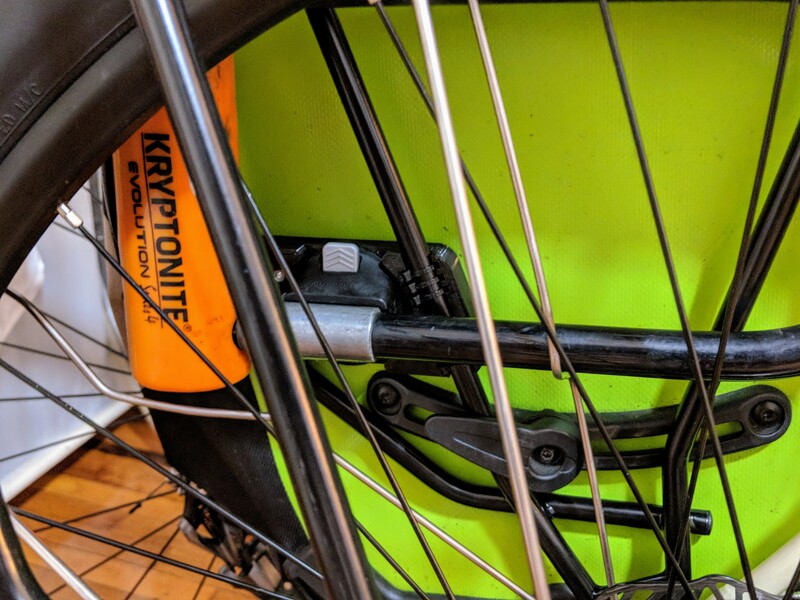 I'd been carrying my lock threaded through my rear rack with an ad-hoc installation of the Kryptonite mounting bracket to keep it from rattling. That worked fine, but it meant I couldn't put both of my panniers on the rack if I needed to. When I got the new bike I wanted something a little more elegant that wouldn't interfere with hanging the panniers. I discovered the Tubus Locc rack after I'd purchased and installed the rack on this bike, and I'd have had to replace my lock. But I really liked the Tubus Locc's mounting concept. 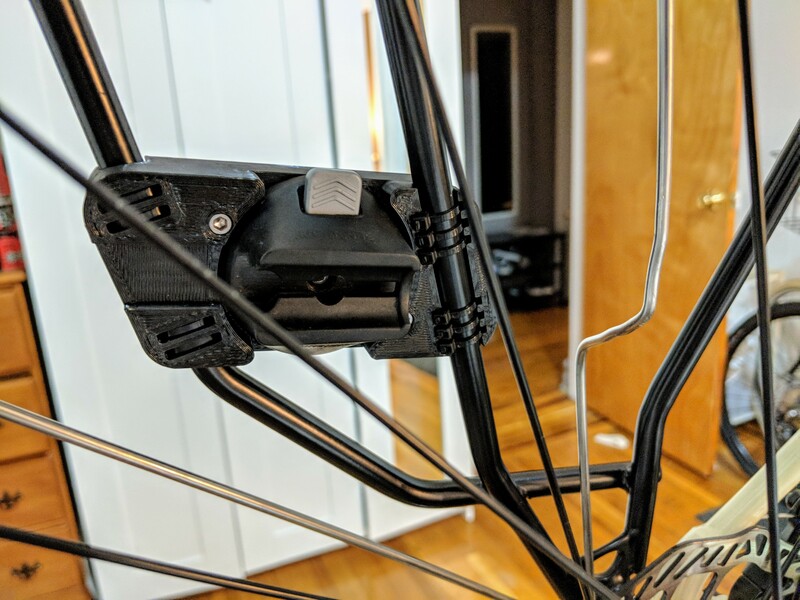 So I designed and built a 3D-printed mount to adapt the Kryptonite mounting bracket to the space between my rear wheel and the inside of the rack. The lock fits nicely between the rack and the wheel. It touches the rear fender, but has reasonable clearance with wheel itself. 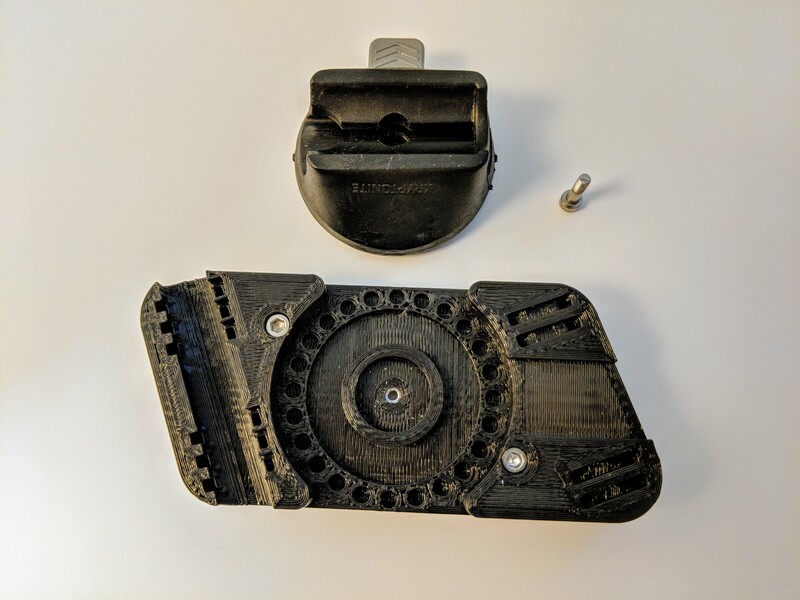 The 3D printed portion of the adapter is sandwiched in between the commercial fiber-reinforced mount and a tapped piece of 3/16" thick aluminum that bridges across the thinner portion of the adapter and provides some reinforcement. 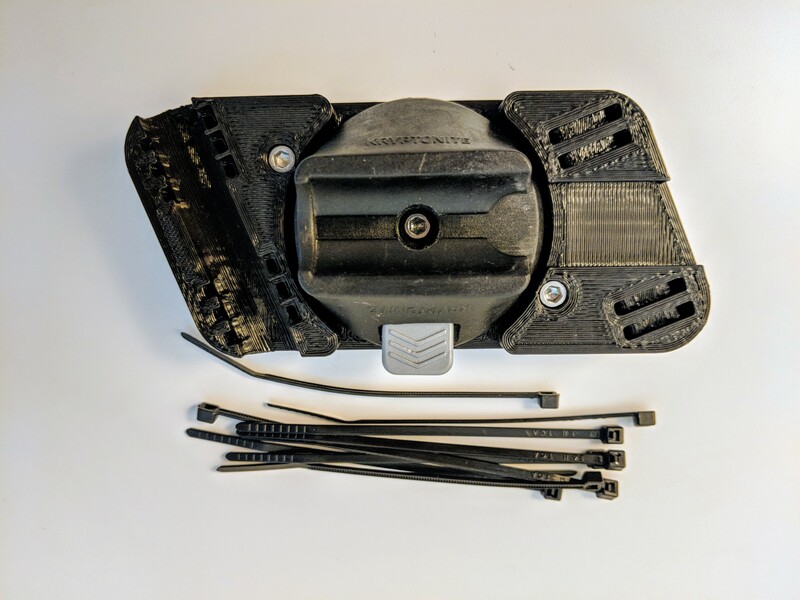 I've considered redesigning it to be even stronger, but have not had any problems in the 7 months or so I've been using this mount. The adapter is held to the rack by ten small nylon cable ties. 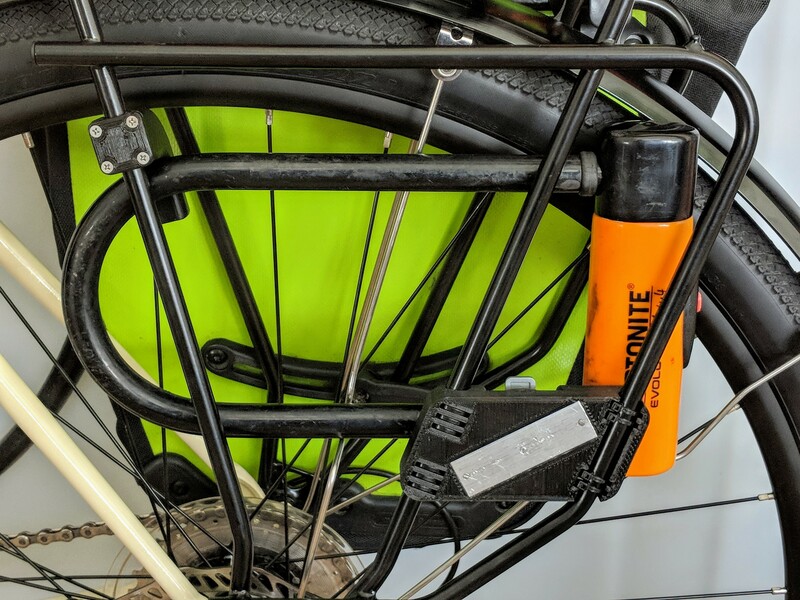 The lock mounting latch is adjusted so that the lock shackle is slightly preloaded against the rack tubing when the ock is latched into the mount. It's easy to get in and out but tightly held so it doesn't bump or rattle. 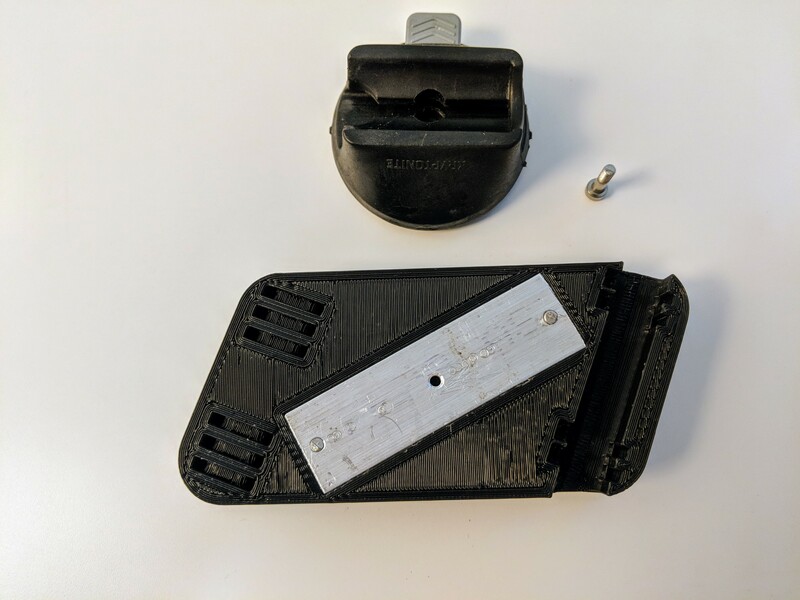 As a precaution in case the setscrew on the lock half of the mounting latch loosens, I added the extra hook near the front of the rack seen in the first photo on the page. This will keep the lock from rotating into the wheel if the setscrew is loose, but so far it's not been necessary. 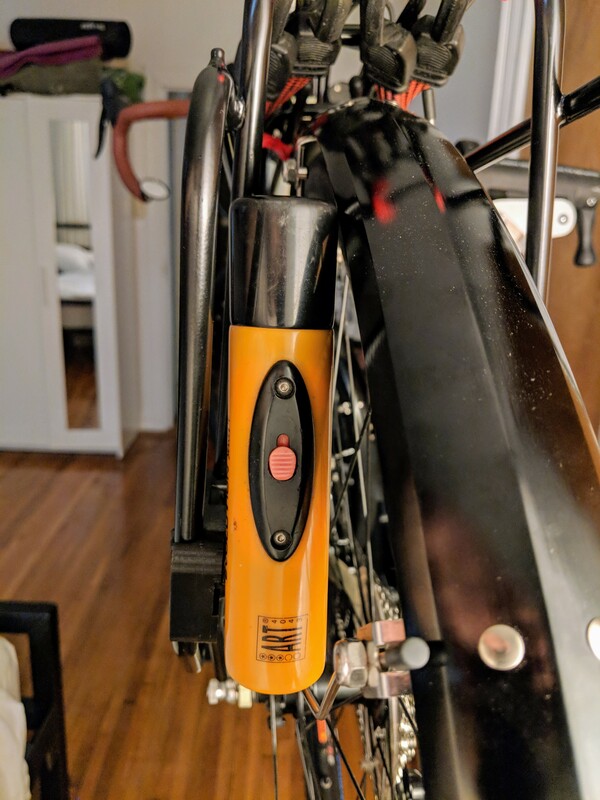 I finally have a lock mount that I like. It's compact and convenient, and doesn't interfere at all with the left-side pannier. It's easy to access even with both panniers in place on the bike. The only way it'd be better is if it were fully integrated into the rack's design like the Tubus Locc is. I'm still keeping a close eye on this mount to make sure the 3D printed PLA is holding up to Brooklyn's bumps. I might reprint it in ABS, but so far it's holding up.